Infant wearing a gown and sitting on a wooden corner chair. 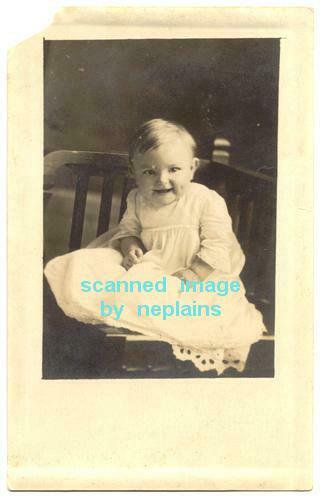 "Ludvik Josef Travnicek age 7 months" is penciled on back. Location is unknown; photo was found with other items from southeast Nebraska and northeast Kansas. Minor corner wear, except that upper left corner is broken away and missing.